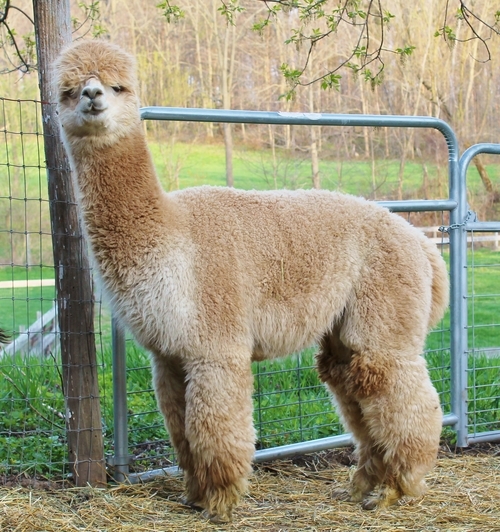 Bernie as a Cria - Dense, Fine Fiber! We are proud to own Res. Ch. 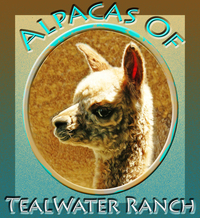 Tealwater Brilliance Expressed, affectionately called Bernie, the stunning result of exceptional quality imports from Peru. 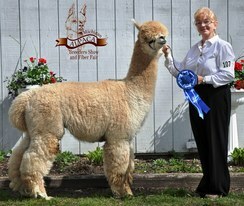 In his pedigree are two well-known super studs who contributed to the growth of America's world class quality alpacas. His sire is National Champion Accoyo Express, a prolific stud carrying full Accoyo bloodlines extremely rare in the US, with an amazing record of producing champion offspring. 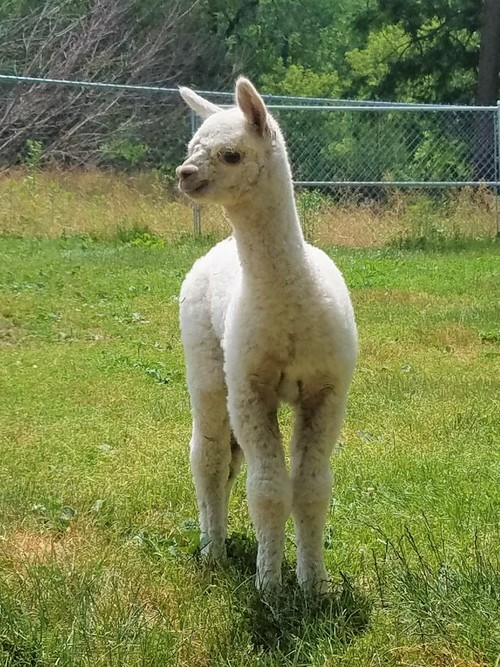 For this breeding we drove our very special Brilliance De Peru daughter from Michigan to Irish Meadows Alpaca Farm in Iowa to breed to Express...it was well worth the drive! 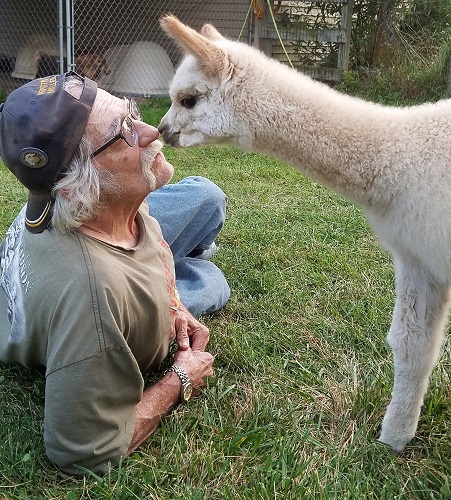 Bernie's mother Sunshine was the first cria born on our farm, a beautiful big boned girl out of our purchased import Cachi, who was bred to Brilliance before she came to our farm from Washington state. The males behind Sunshine are legendary for carrying and producing exceptional lingering fineness and density. Read up on Peruvian import Guellermo, his son Peruvian Ion, or grandson Brilliance De Peru and you will know that this genetic line produces fineness year after year as the alpacas age, and these studs sold for tens of thousands! They have left their mark on many breeders' farms producing top show champions in the US and Canada. We chose these bloodlines for our foundation stock. Bernie started showing as a juvenile/yearling in 2011, up against beautiful males and coming in 2nd place in three local shows. In 2013 we entered him one more time. He earned a 1st place with his density the deciding factor over a striking, equally fine and well structured adult, then Bernie took Reserve Champion. 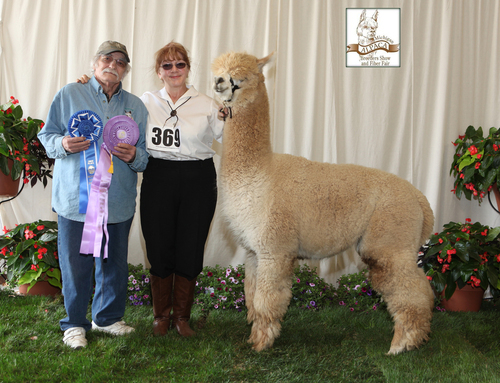 In 2014 we again took Bernie to the Spring Breeders Show, where he earned a blue over competition - there were no champion ribbons offered at this small, friendly show. We bred Bernie in 2016 to our Snowmass Satin Symphony, daughter of 2X herdsire of the year Snowmass Elite Legend. On June 4th, 2017 Satin gave birth to a beautiful ~19 lb. 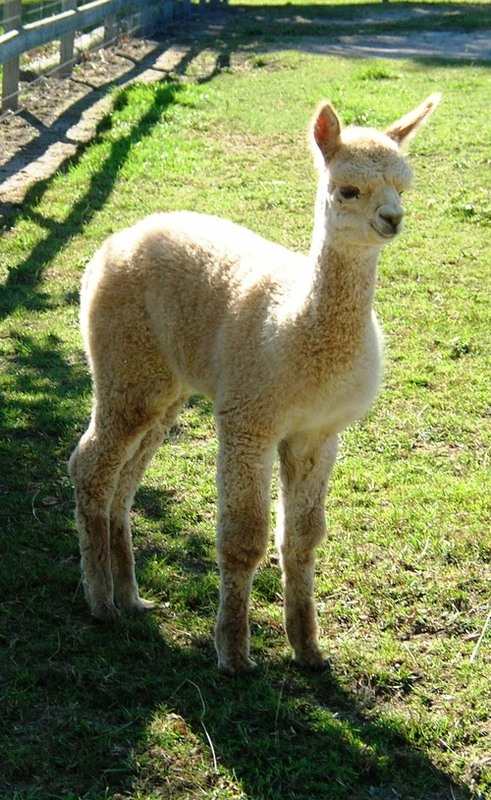 male cria, with the confidence and structure of his sire, Bernie. Born predawn during a rare celestial event, Jupiter has the fabulous fine, dense fleece expected from pairing these exceptional bloodlines! Bernie's heavy and fine fleece blanket after shearing is one of our best with delicious handle and brightness. 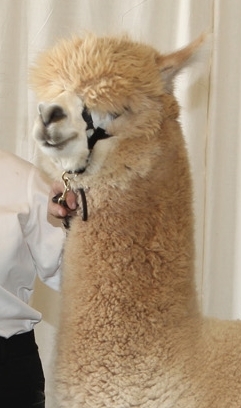 In 2016 Bernie's fleece blanket was entered in an AOA certified fleece show - at almost 6 years old he scored 72.5, with a 15.5 score out of 20 points possible on fineness and handle, 6 out of 8 points on micron, and 7 of 7 possible points on staple length. Judge Wade Gease commented "Big volume fleece with character and density". This is a calm, macho stud with a great personality and healthy vigor, easy to handle and lead. Drive-by stud service is available within 2 hours drive of our farm - your girls won't be disappointed when Brilliance Expressed, AKA Bernie comes to visit your farm!